Haas is the sixth Navy officer, including two admirals, caught up in the growing scandal. Three officers have been arrested. The admirals and Haas have not been charged. 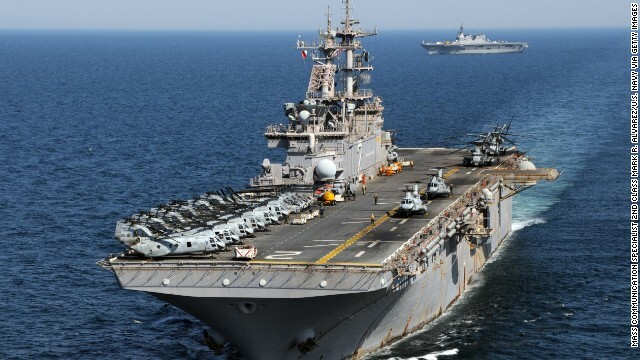 Glenn Marine provides security, supplies and other services to U.S. Navy ships at various ports around the world. It is alleged some of the Navy officials directed ships to ports where Glenn Marine did business after Francis bribed the officers with cash, tickets to concerts like a Lady Gaga show, and even prostitutes. Francis also is charged with conspiracy to commit bribery in the case. The Coastal Riverine Group conducts port and harbor security, high-value asset protection, offensive combat operations and maritime security operations in rivers, harbors and coastal waterways. I can see this happening, I'm just glad that we have a system in place they can identify it and punish those responsible . Well, in this case, Mr. Fat Leonard is not the only one to be blamed. He deserved a fair trial & justice must be shown here. If he is found guilty, he must be given a chance to choose a jail term or pay the fine. Remember, he's NOT a murderer. The media has made this issue an "overkill" like in the Michael Jackson case. They are very good in doing this. As usual, they're arresting the low-level guys but the admirals are just getting reassigned. If anything, they'll get demoted a pay grade or two and allowed to retire for crimes that the enlisted rabble would go to federal prison for. "Haas is the sixth Navy officer, including two ADMIRALS, caught up in the growing scandal." Reading comprehension is always a good thing. As usual, those charged will escape serious punishment. What the military needs is a culture based on accountability, honesty, integrity, and performance. The lack of discipline starts with not punishing the shenanigans that occur at the service academy's, to not punishing miscreants in the national guard – the Arizona national guard scandals would be a good example, to full scale bribery scandals involving multiple senior officers, The firing squad is too good for these guys. They have dishonored their country and it's citizenry, and should be punished harshly. Greed – not Capitalism. You go to a Socialist based country where everyone is paid equally regardless of their work and you'll find bribery common place. Even services that are supposedly "free" will cost you money to get. An ordinary request for services from a government office will take three or months to fulfill. If you want it earlier you have to pay. Whatever you want to call it – GRAFT – BRIBES – whatever. It has nothing to do with Capitalism. Another waste of tax dollars. These naval officers are incredibly dishonorable and certainly weren't subject to over site by the chain of command. There are fat leonard's everywhere and they need a bullet in the head. They should investigate all the people at COMLOGWESTPAC as well. Guarantee Fat Leonard had them in his hip pocket too.